With a lap of the Red Bull Ring being as short as it is, there is no better place to find crucial tenths – if not hundredths – of a second to maximise qualifying on Saturday. With time between races being particularly short, Austria presents a chance to optimise and eek out more performance from parts brought to France last week. For a few others, however, it is also a prime opportunity to unveil large-scale changes in a bid to leapfrog a rival team or try to get the car working properly ahead of Silverstone in just seven days. Since Monaco the W09 has undergone a series of small changes from race to race; a detailed approach is key to optimising the car to suit the requirements for each circuit. Having a large budget means that temporary solutions to the car’s aerodynamics – such as the Stegosaurus-like vortex generators atop of the sidepod – and cooling are in a constant state of change. This is very typical of the Anglo-German outfit, who have gradually led others towards a trickle-through development path for each round rather than withholding an update package for a specific race. In Austria, however, Mercedes have opted to debut wholesale changes to the car’s aerodynamics. The new parts are very much influenced by other designs up and down the grid, incorporating ideas from chief rivals Ferrari and Red Bull, and McLaren as well. During the launch period of the 2018 cars it was interesting to note that Mercedes had carried over a traditional sidepod inlet, compared to the likes of Red Bull and Ferrari who were lowering the upper side impact structure to create more complex surfaces, the latter team pioneering this layout. While changing the position of the side impact structure would effectively warrant a chassis redesign – an expensive and time-consuming task reserved only for the winter – Mercedes has aimed to replicate these complex surfaces around their current sidepod design without compromising their cooling package. The fundamental shape of the inlet remains the same, however the aperture has now been sunk rearward slightly and prominent upper and lower ‘lips’ are formed to work the airflow harder. Any air that hasn’t been influenced by the new bodywork passes through the radiators behind – this should produce more consistent aerodynamic performance, for any air normally buffeting around the inlet is tidied up by the lipped bodywork. 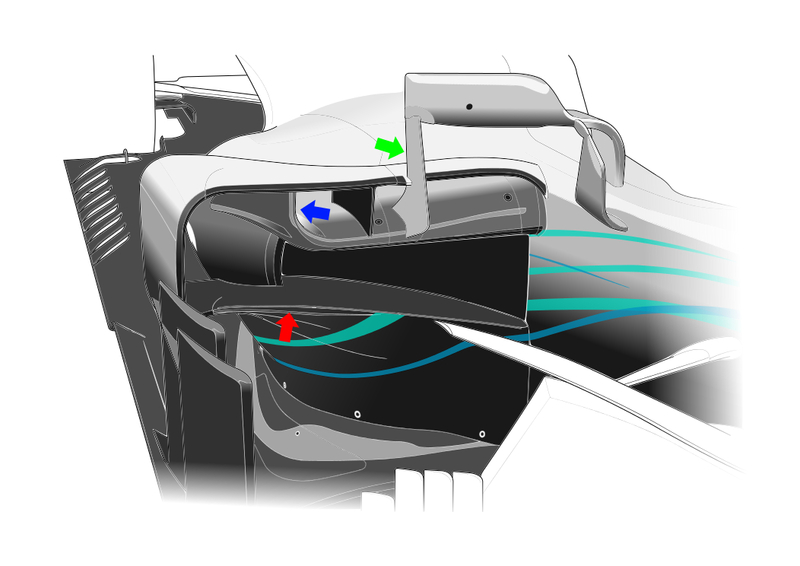 The upper lip curls up at the end to meet the existing horizontal bladed vane (blue arrow), while the lower lip forms a shelved area (red arrow) that connects to the large baffles that protect the sidepod shoulder from the front tyre’s turbulent wake. The lower lip energises the flow along the car’s flanks by causing it to dive, reducing drag and extracting further performance from the rear diffuser and various devices along the top of the floor. Further Red Bull cues are evident in their revised mirror pod design, featuring a vertical piece ‘supporting’ the end of the housing (green arrow) although its primary aim is to turn the airflow as it passes over the upper lip. Elsewhere on the car a downturned vane attached to the cockpit side is now present, working in conjunction with the bargeboard it is tucked behind to enhance the effects of the new sidepod opening. At the back of the W09 the rear wing endplate has been extensively redesigned to promote the out wash of air behind the rear tyre, essentially copying what McLaren has used since the beginning of 2017. Renault have also gone down this route more recently, presenting a series of hanging turning vanes to guide the air outwards in a similar fashion to the diffuser below. Both drivers were immediately happy with the upgrades, reporting better rear stability which not only increases driver confidence, and therefore laptime, but also allows the driver to control tyre degradation a bit better. Having made steady overall progress during the early stages of the season, McLaren are at huge risk of slipping backwards in the standings if they fail to get on top of their problems soon. After the French Grand Prix the team announced that they are facing an aerodynamic problem which is unidentifiable in the wind tunnel. While they failed to disclose exactly what the issue is, it is likely to be how aero-sensitive the car is to the deformation of the tyres under certain load conditions/ride heights. Perhaps having known about this issue for some time, McLaren have introduced an all-new front wing design that works the air in a completely different manner to the previous version. The new wing bears a few features which strongly resemble one the team trialled at the end of 2016 – ahead of the big regulation changes – but have not been returned to since. While the regulations dictate the leading edge of the wing must be angled, it is worded such that two end points of the diagonal line must be within a bounding box. It is for this reason that McLaren are able to create a crinkled leading edge, the outboard section of the wing presenting itself to the oncoming air at right angles. Facing completely perpendicular to the flow seems like a trivial change, but could have quite substantial effects on flow behaviour over the rest of the wing. The outboard area in general has been overhauled, now devoid of an arched tunnel and instead completely flat where it meets the endplate. This will significantly alter the size and strength of the vortex shed by the wing around the bottom of the front tyre, as the flat geometry discourages swirling of the air but does induce a greater pressure gradient between the front and back of the wing. Revised cascade winglets first introduced to the car in Monaco are also present, although it is unclear whether the car will continue to run with this specification wing for the rest of the weekend. 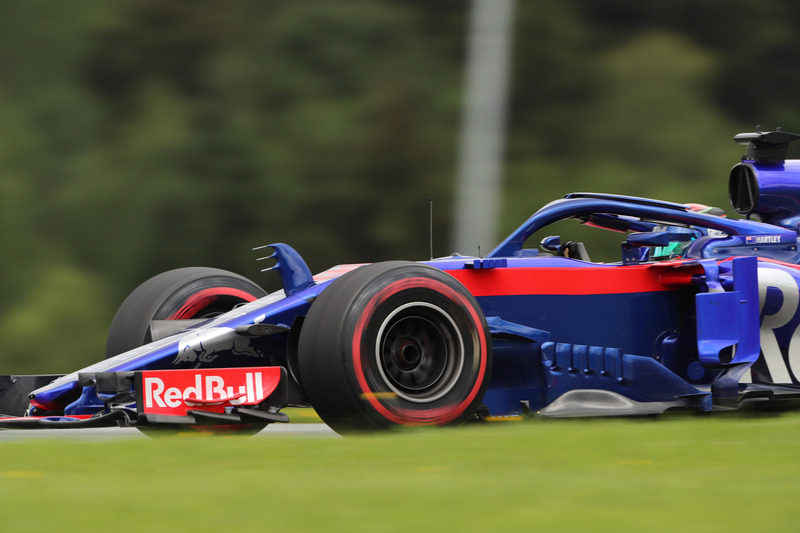 The design team at Toro Rosso are known to be youthful and extremely creative, often coming up with unique solutions both mechanically and aerodynamically that are often copied by other teams the following season. 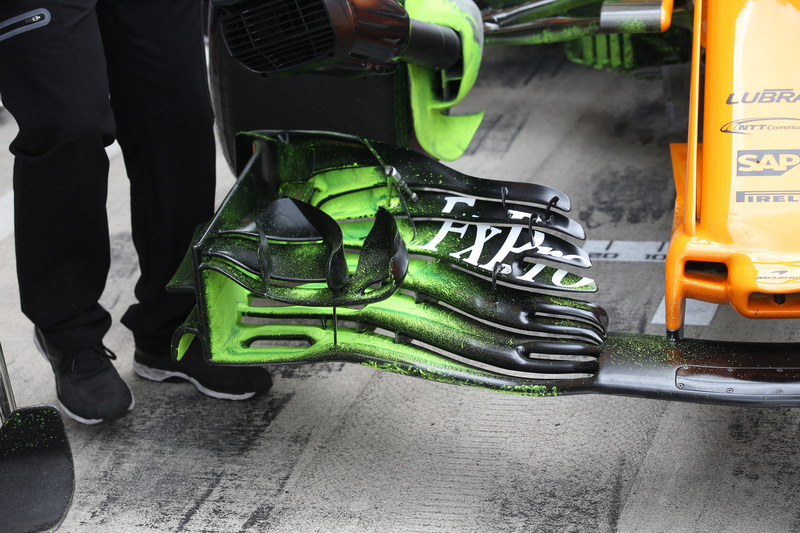 Perhaps we will see future imitations of their bold front wing footplate design, new for Austria this weekend. Designed to induce a vortex at the back of the wing, the arched footplate provides a surface for air to spill over and begin to rotate as it is driven by low pressure on the underside of the wing elements. Toro Rosso – perhaps having seen the benefits of subdividing aerodynamic components to manipulate the air in detail – are the first to decompose the footplate into three distinctive sections, inducing a series of vortices that feed into each other to create a stronger vortex along the ground around the front tyre.